2 Stews: Am I Blue? Often as an artist, a material will tell you what it wants to be. For me, food can be the same way. So when I bought a jar of blue poppy seeds in Paris and then a set of miniature loaf pa ns at home, I knew what I had to make. 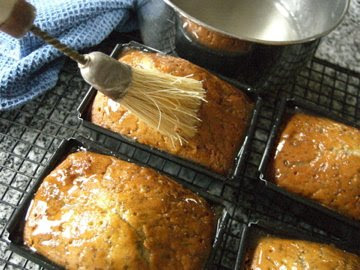 Small loaves of Lemon Poppy Seed Cake soon emerged from those Lilliputian loaf pans. Blue food is just plain fun. You really can't tell that the seeds are blue or gray in the pale yellow cake, but they looked so appealing in the jar on the store shelf. They give the subtlest crunch to this fresh, buttery cake. 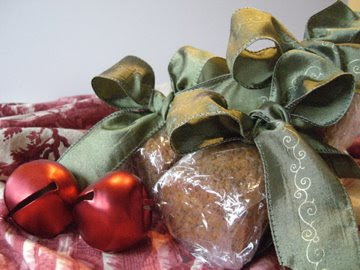 The little loaves are perfect to give away at holiday time, alongside a plate of homemade cookies. A lemony sugar syrup is drizzled over them as they cool from the oven to give them a more robust lemon flavor and longer shelf life. These are so tempting with their delicate texture and come hither taste, that shelf life will not be something you'll need to worry about. In a medium bowl lightly combine the milk, eggs and vanilla. 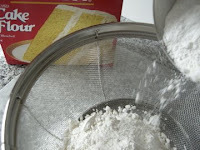 In a large mixing bowl combine the dry ingredients and mix on low speed for 30 seconds to blend. 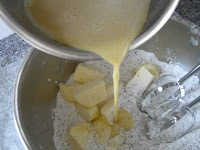 Add the butter and half of the egg mixture. Mix on low speed until moistened and then on medium speed for 1 minute. 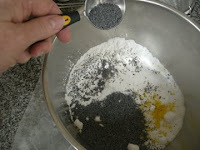 Gradually add the rest of the egg mixture, while scraping down the sides, and beat for 1 more minute. Scape the batter into 6 greased and floured pans miniature 2x4 inch loaf pans. Bake for 20-25 minutes or until a toothpick comes out clean and they are golden brown on top. You may also use a 4x8 loaf pan and bake for 55-65 minutes. Make the lemon sugar syrup just before the cake comes out of the oven. Put the sugar and lemon juice in a small saucepan and heat just until the sugar dissolves. 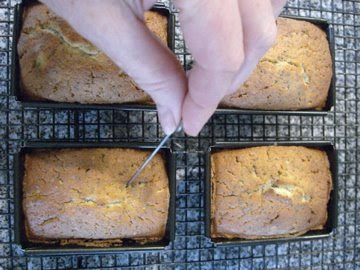 After taking the cake out of the oven, poke it all over with a metal tester or thin skewer. Brush with half of the syrup. After slightly cooled, take out of pan and poke with skewer on the bottom and sides, and then brush with the rest of the syrup. Cool and wrap with plastic wrap and let sit overnight to fully absorb the syrup. Store for up to 4 days room temperature, 1 week refrigerated. Thank you for sharing this recipe! 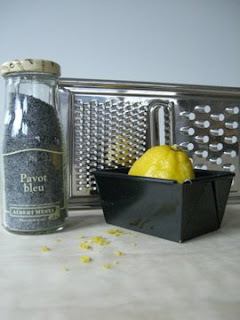 I've been looking for something similar after I had a piece of delicious lemon poppy seed bread from an espresso stand in Kalispell, Montana. 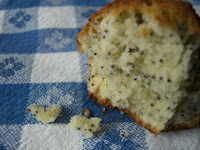 This is the closest recipe (from what I can tell) to the heavenly lemon poppy seed bread I've been craving :) Thanks again! Awesome recipe, I am at a high altitude and so I added an extra tablespoon of flour to the mixture- this worked out great.